If the weather's nice, your dog will probably appreciate a nice breeze. Even if your dog jumps for joy at hearing he's going for a ride, his excitement will be short lived on a long trip to his new home. Preparation, lots of plastic and a trip to the vet can help your big guy tolerate the long drive. Book a room at a pet-friendly hotel ahead of time if your trip will take more than 12 hours. Not only will you be tired after 12 hours of driving, but your pup will be fed up with the car by that time. It's better to split the trip into multiple days. Always ask about restrictions at the hotel. Some breeds aren't allowed, while some hotels require a nonrefundable fee. Plan your trip ahead of time. Pack snacks and even meals in a cooler. You don't want to leave your pup in the car alone, so only stopping for gas and stretching is the best plan. You can drive through a fast-food joint, but sit-down restaurants are out of the question. Teach your dog the car is a reward machine. 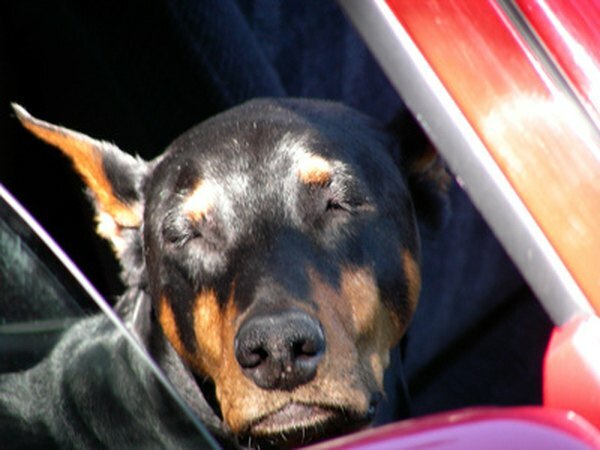 If your dog has never been on a ride, the first step is to acclimatize him to the car. Depending on your pup, this could be a quick or long process. If your dog seems wary of the car, give him a treat just for getting close, then for inspecting things when you open the door. Gradually increase his time spent around the car until he's eventually inside, but only on his own accord, never against his own will. Take regular short trips about a month before you leave, increasing the time of each trip by a few minutes each day until you're driving for about 20 minutes regularly with your little guy in the car. About two weeks before you leave, drive for about an hour with your dog. While an hour isn't long-distance, it prepares him for a lengthy car ride and gives you a bit of insight as to how he'll handle the long ride. Keep his food away from him the day you're leaving. Short trips are bad enough when it comes to your dog getting carsick, but hours and hours on the road is even worse. 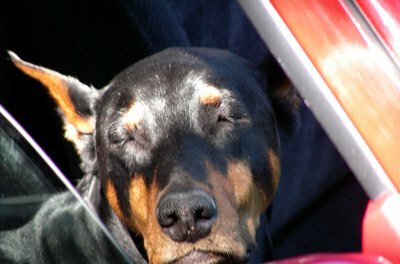 If your dog has vomited before in the car, talk to your vet. He might prescribe your pup medicine to make him feel less sick on rides. Cover your back seat with plastic wrap. Even without dinner beforehand, your dog might get sick during the ride. Cleaning up plastic is a lot easier than cleaning leather or cloth, especially on a long trip. Place your dog's bed on the back seat if he's riding without a crate. If you plan to keep him in the crate, lay a small bed or something soft inside. Place an old towel on his bed in case he vomits. Secure the crate or your pup in place. Seat belts will secure crates, while a seat belt harness will secure canines. Place a toy or two on his seat to keep him busy, although he'll probably sleep for much of the journey. Stop every two to three hours at a rest stop. Take your dog outside on his leash and let him walk, use the bathroom and stretch his tired legs. Give him plenty of water to drink. After 15 minutes, coax him back in the car and start the next leg of your trip. Always use a seat belt harness or crate when taking your pup on car rides. They help protect your dog in case of an accident, and they also make him feel secure. Do not give your pup treats while on the ride. They can make him sick. Make sure your dog is outfitted with his identification tags when you leave. The Michigan Humane Society also suggests microchipping your pup before you leave. A microchip enables shelters and vets to identify who your pup belongs to if he gets lost. Keep an eye on your pup during the trip, making sure he's OK and that he's not harming himself inside his crate, especially since he'll have his collar on. Never stop on a road or highway to let your dog out. If he's whining and needs to relieve himself, pull in to a gas station or parking lot. Never give your dog human medication meant to relieve motion sickness prior to consulting your vet. Do Groomers Trim Dogs' Whiskers?